Sian Ka’an Village is raising the bar on luxury accommodation within the Sian Ka’an Biosphere, Mexico with its rustic yet elegant suites that are changing the standard on eco-friendly vacationing. 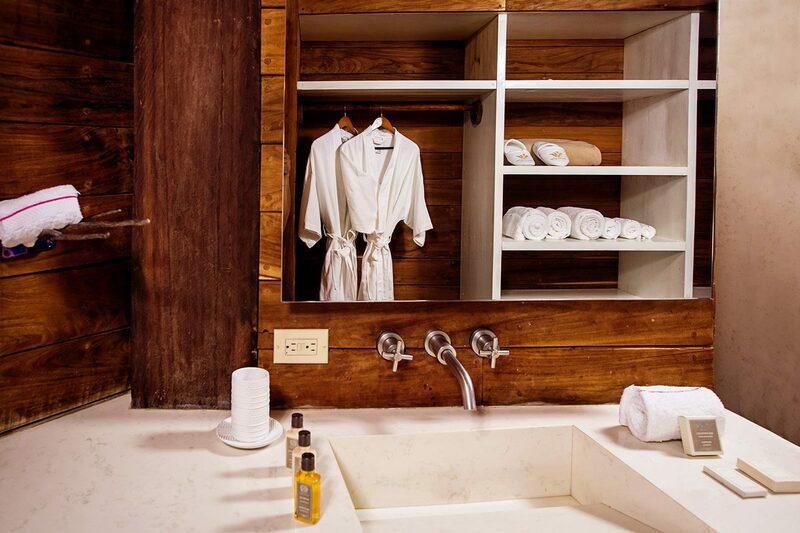 From Premium Master Suites, with oceanfront views and jaccuzi bathrooms to Cabin Suites with luxurious amenities and spacious interiors, each provides the ultimate safari-like escape for visitors to the Sian Ka’an Biosphere on Mexico’s Caribbean coast. In total, the 7 bedroom, 8 bathroom property includes two Premium Master Suites, two Master Suites and three Cabin Suites, each decked out with luxurious linens, air-conditioning climate control and en-suite bathrooms. For those seeking the ultimate in luxurious living, the Premium Master Suites offer the most space, as well as idyllic views of the Caribbean Sea from expansive terraces that make watching the sunrises a daily affair. Boasting a larger en-suite bathroom than the other cabins, the Premium Master suite contains a luxury whirlpool tub, a separate rain shower and the utmost in spa-inspired comforts. The 592 square foot space is perfect for romantic getaways and small family affairs. The idyllic seaside escape also offers two Master Suites that come with many of the same features, including a comfortable double bed, fine quality linens and additional space for a foldaway bed for small children or additional guests. While the Master Suites have a slightly smaller bathroom, they still inspire with modern amenities and luxury accommodations. Cast off on an imaginary Spanish Galleon, while enjoying the seaside views from your Master Suite’s spacious balcony and tropical hardwood paneled interior. Equally luxurious are the three Cabin Suites that offer occupancy for two adults. Complete with a full bathroom and a double bed, two of the Cabin Suites are situated on the ground floor with walkout patios leading to the main deck ideal for viewing the beach and sea, while another cabin is located on the second floor. Each cabin makes for a “suite” experience filled with comfort, luxury and a bit of imagination. 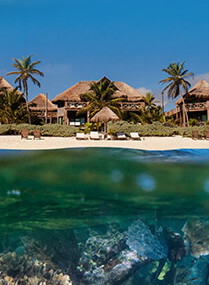 For ultra luxury vacations in the Sian Ka’an Biosphere, Sian Ka’an Village should be your first choice.